Out December 12 from A Wave Blue World, the comic anthology All We Ever Wanted includes an impressive collection of creative talent. The anthology is filled with stories that present a brighter vision of the future. No doom-and-gloom here! These sci-fi tales are meant to inspire hope and restore the belief that a better world is possible. The cover is by Ariela Kristantina with colors by Michael Wiggam. You can pre-order it now from your comic shop with Diamond Order Code: OCT181514. A Wave Blue World has hooked us up with an exclusive look at Chris Peterson‘s “Una,” which you can read below. The overused term, “rules are made to be broken,” has been said repeatedly when it is thought that someone has gone against convention. As the world slowly embraces the diversity that surrounds it, so has popular media. Comics have always challenged type but has mostly been monochromatic. It has only recently been proactive about being diverse in not only race and sexuality, but also ability. Wave Blue World‘s Broken Frontier offers up stories where they do just that, break the rules. In “Phantom Limb Ghost Puncher,” a police officer who loses his arm during a rescue, magically receives a mystical weapon which changes his life instantly. In “Stranger Than Fiction,” a clairvoyant helps out a murder suspect, by revisiting the day of the crime through his unconscious mind. In “Dark Dark World,” young imaginative writer plays out a scene for a story, all in her father’s work shed. In “The Wall,” set in a dystopian future, societies’ fortunes are separated only by allegiance. In “Flyer,” a elderly man, gives a prep talk to his adolescent granddaughter, as she prepares to engage in a dogfight by way of rocketpack. “In The Night, Mountains Grew,” a ranger’s gross miscalculation proves fatal for those she protects. In “The Beard,” a young woman uncontrollably grows a facial hair at a unusually rapid rate, something befuddles her day after day, until she realizes her greater destiny, one that would change her life forever. In “Purgatory,” a woman falls into a coma, and gets transported to a different world, where she gets to be her true self. In “The Trip,” a rather routine start of a morning for a man and his daughter, becomes a lesson in realizing every day is precious. In “Its About Time,” a scientist uses his considerable powers to time travel before his wife died, but what he finds out changes his whole outlook on her. In “Inside Outside,” a woman coming off her meds is constantly irritated by “cute squishy monsters.” In “Last dance at Omega Point,” as a rocket heads to its firing point, a woman’s life unpacks in alternate reality. Overall, an excellent comic anthology which explores what can be or what will be. The stories by all the writers pluck the emotions of the reader in the best way possible. The art by the creators are all beautiful. Altogether, a plus sized comic treat which entertains on every page and you will wish was longer. Having debuted in 1944’s Bomber Comics #1, “Kismet, Man of Fate” never had his own fate revealed despite being comic books’ first Muslim superhero. Over seventy years passed between his last adventure fighting Nazis behind the front lines in war-time Germany and just last year when he returned as part of The Broken Frontier Anthology, a successful Kickstarter campaign from publisher A Wave Blue World (AWBW). Now, the same Eisner Award-nominated team that brought back the character is continuing his modern-day adventures in the weekly Kismet, Man of Fate online feature as part of the AWBW’s Under Current imprint. Writer A. David Lewis and artist Noel Tuazon are joined by colorist Rob Croonenborghs and Ghost Glyph Studios in bringing Kismet to the current day. Beginning May 2nd and running two pages per week for the next year, the storyline will pit Kismet against the climate of the 2016 U.S. Presidential campaign and its ensuing fallout in Boston and beyond. Additionally, the issues of LGBTQ rights, experimental science, and immigrant communities will feature prominently in the year-long storyline. Kismet was created at a moment where fascism was a real and present danger. With the political climate being what it is right now – with Islamophobia, homophobia, anti-Semitism, and hate crimes all on the rise – there seems no better time to reengage the character. Kismet, Man of Fate is available weekly with the initial pages already available for free viewing. The completed storyline will be available in print in 2018. An Alaskan ranger, a maiden scorned, a family of bootleggers; all cling desperately to the things in life they hold most dear… and woe is the fate of those who mean it harm. After their story “In the Night, Mountains Grew” (part of the Broken Frontier Anthology released earlier this year) received so much praise, Marguerite Bennett (Bombshells, Insexts) and artist Varga Tomi didn’t want their collaboration to end there. That’s why they teamed-up for 2 new stories, “Koi” and “Cider” to put alongside the re-presenting of “In the Night, Mountains Grew” in a brand new one-shot collection containing a trio of terrifyingly twisted tales. While Ghastly Tales will have a worldwide digital release through ComiXology, the print run is limited to only 400 copies and was not solicited through the direct market. Instead, publisher A Wave Blue World worked with retailers who’ve supported their books in the past to make the one-shot available in select locations across the U.S. Copies of Ghastly Tales are also available through the publisher’s website, where signed copies by both Marguerite Bennett & Varga Tomi can be purchased as well. These come with a certificate of authenticity and are numbered to only 30 copies! Today comiXology unveiled the latest group of publishers offering DRM-free backups, allowing comiXology customers to download and store copies of their books. ComiXology’s new DRM-free backup feature was announced this past July during San Diego Comic-Con. The second wave of participating publishers include IDW Publishing, Valiant Entertainment, Oni Press, Fantagraphics Books, Aspen Comics, Action Lab Entertainment, Th3rd World Studios, A Wave Blue World, Blind Ferret Entertainment, Caliber Comics, Creative Impulse Entertainment, Devil’s Due Entertainment, GT Labs Comics and Kingstone Media. They join Image Comics, Dynamite Entertainment, Zenescope Entertainment, MonkeyBrain Comics, Thrillbent, and Top Shelf Productions in offering this new option to customer. 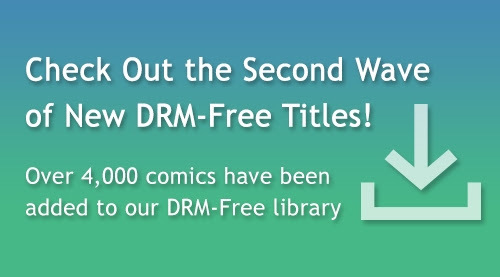 Creators using comiXology Submit also have the option to offer their comics, graphic novels, and manga as DRM-free backups. Some of the new publishers have previously announced going DRM free, or provide the option on other platforms. To obtain the DRM-free backups of digital comics on comiXology, customers can go to the “My Books” section of comixology.com on their desktop computers and click the button that appears next to their books. Books and series from the second wave of participating publishers will be available for backup starting today. Backups from participating publishers can be downloaded in high definition PDF and CBZ. Customers will continue to enjoy all their purchases – whether available as a DRM-free backup or not – on the comiXology platform in comiXology’s exclusive cinematic Guided View reading experience, anytime and anywhere.